You may know every chord in the book. You may be a master shredder. A theory whiz. But if you can't make your guitar emote, you're missing out on a whole other dimension to your playing. Your guitar speaks not only through what you play, but how you play it. The more articulate your playing, the more effectively you are able to express yourself. One of the techniques that will get your guitar talking—and wailing and moaning—is string bending. Normally when you fret a note, you push it straight down on the fingerboard. But when you bend a note, you pluck a fretted note (the bend's "origin" note) and push or pull the string with the fingers of your fretting hand, stretching it across the fingerboard toward the upper or lower string so that it rises in pitch and becomes another note (the "destination" note). The pitch rises because you are effectively tightening the string by bending it. String bending is one of the most important aspects of playing lead guitar. Without articulation, that voice-like quality, your phrasing will lack dramatic expression and can end up sounding dull and uninteresting. A lot of people struggle with bending, however, because there isn't a very precise science to it, like there is when fretting notes. Creating emotion is not something you can easily teach. It has more to do with feeling, experience, and having a good ear than it does having strong fingers and a wealth of book knowledge. The following are some tips for learning how to execute the all-important string bend. A key factor in bending is string gauge, or the thickness of your strings. The overwhelming majority of string bends take place on the top three strings (G, B and E). Coincidentally, they are the lightest gauge strings and easiest to bend. Strings come in a variety of sizes, ranging from extra super light (8's) to extra heavy (13's). Although some guitarists prefer a thicker string, a good gauge to start with is a 9 as they are relatively easy to bend. Be aware that bending strings on an acoustic guitar is much more challenging than it is on an electric guitar as acoustics tend to have heavier strings that are under more tension, and the action (how high the strings are off the fretboard) is typically higher. When first learning how to bend, it's best to have all your fingers involved. Your bending finger needs a helper or two. Remember, your guitar strings are under tension, and that tension is working against you. That's why you almost always use a helping finger to get the string moving. If you are bending with your third finger, for example, you would plant your second finger (and possibly your first as well) on the same string behind your bending finger and push with both fingers, or all three. Don't worry about placing the helping fingers exactly in the fret. Since you can't actually hear them, their position is irrelevant. However, keep them close to your bending finger. Although the most common bending finger is the third finger, you should learn to bend accurately with each finger, including your pinky. The "muscle" behind a bend actually comes from your wrist, not your fingers. When bending, you want to use a motion like turning the key in the ignition of a car. Rotate your forearm, and don't get in the habit of stretching your fingers to make the bend as it can be a hard habit to break. A good rule of thumb when bending is the low three strings (E, A, D) should bend down towards the floor while the high three strings (G, B, E) should bend upwards towards the ceiling. The two most common string bends are the half-note bend and the whole-note bend. The problem that many guitarists run into when learning to bend is knowing just how far to push the string. Beginners tend to over bend or under bend. With the half-note bend, you bend the string the equivalent of one fret on the guitar, while the whole-note bend is the equivalent of two frets. Depending on how much you bend the string, you can raise a note up to a step and a half higher than the note of origin, sometimes two with a bit of effort, providing your string doesn't break. Find out for yourself. A snapped string is no big deal, and it'll help you really get a feel for strings. Bends can occur at any speed. A bend should have a natural arc. You should hear the original note for a split second before the pitch rises to its peak. Faster bends move aggressively to their peak, while slow bends, which are often used for special effect, take extra time reaching the destination pitch. Be sure to experiment with bend speed. Wrap your thumb. Good bending technique requires you to wrap your thumb over the top of the fretboard. 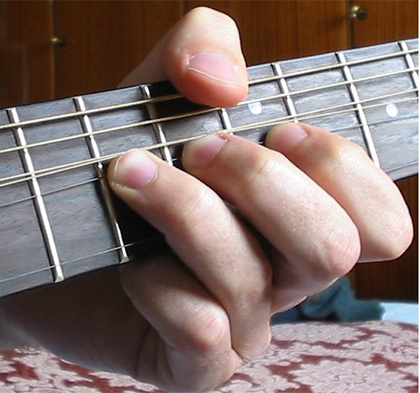 Simply bend the first knuckle of your thumb and place the crease of the thumb at the edge of the fretboard. This way you're only getting the top portion of the thumb over the fingerboard, which is all you need. A wrapped thumb gives you leverage and stability. You can also use it as a target, bending the string up to meet the thumb. With the above tips in mind, let's give it a go, shall we? If you want to bend a note a half step, then first we should check out what "a half step higher" actually sounds like. To do that, simply play the destination note one fret (or one half step) higher than your note of origin. For example, if the note you're bending is on the second string, eighth fret (the note of origin), then play the note on the second string, ninth fret (destination note) to hear how the bent note should ultimately sound. Now play the original note and bend it, keeping in mind how the destination note sounded. Use your ear to match the pitch of the bend to the destination note as best you can. This might take a few tries and it will require that you remember the sound of the destination pitch. But keep playing the destination note and then bending the original note until you hear it match. When you hear it match, hold the bent string in place steadily and let the note ring. Now let's take what you know about the half-note bend and push it even further into a full bend. If you want to bend a note a whole step, then use the same process as above with the note two frets higher than the original (a step and a half would be three frets, and two steps, four frets). You would play the destination note on the second string, tenth fret to hear how the full bend note should sound. Of course, a whole step rise in pitch requires a greater bend, so don't be surprised if the tension is fighting you. It will take a good amount of energy on your part to push that string a whole step and hold it. So you've bent a note and are holding it to allow it to ring. Now what? How do you come down from the peak? There are a number of different variations on the bend release. You might want to give each a try. Releasing a bend is the opposite of executing a bend. When releasing a bend, you lower the note from its destination pitch back down to its note of origin. You should hear the note smoothly descend. This requires that you hold the bend firmly on the way down so that the note is still ringing as it descends in pitch. Don't underestimate the difficulty of this move. Many times bends are played without hearing a release at all. The bend arcs upward and cuts off. This means that you must silently release the bend after it reaches its peak by releasing the pressure on the string. Again, it's kind of a "feel" thing. Basically, you bend the string and you practice letting go of the pressure on the string without letting the string straighten out. Then you straighten the string as quickly and silently as possible. This is a very important movement to conquer because there are tons of musical examples in which you will bend up and immediately move to a note on a higher string without releasing the bend. This variation requires that you bend the note up, and while the note is at its peak, pluck it again to start the release. You can also think of this as a "grace note release." The release can be slow or fast, your choice. This variation is a little advanced but very cool. A pre-bend requires that you bend the string up silently before you pluck the note at its peak and only hear the release. This is a tricky move that will really test your sense of touch and call on your bending experience, since you have to imagine the pressure necessary to stick the bend without actually hearing the note rise. This variation is just like the basic bend and release, except that you immediately bend again. It should sound like one smooth movement going up, then down, then back up. It's easy for the energy to die out on this one, so it's usually performed fairly quickly. If the note is "dying" before you've completed the bend, you've probably stopped exerting enough pressure against the fretboard to keep the note sounding. Use your backup fingers. Bending can cause the strings to break or the guitar to go out of tune. Bending requires finger strength. It is not uncommon for bending to be very awkward and tiring for the hands. However, with enough practice, this subsides. Learning to bend well is a challenging endeavor that requires determination and patience. For inspiration, here are three of the best string benders in music. Listen closely to how each makes his guitar talk. For more on string bending, check out GT's Anders Mouridsen's tutorial Introduction: Bending & Vibrato in Rock. Trying to learn everything about guitar playing. I want to learn these techniques .. Please send me .